Extra Judicial Killing: Spot Narshingdi: Follow up Report. Spot Narshingdi: Follow up Report. "RAB Shot them from Point Blank Range": Eyewitness. The three-inch deep hole, apparently created by a bullet fired from point-blank range, at the spot where one of the six bodies was found on the road. We have reported about the latest extra judicial killing in Narsinghdi, that caused 6 lives in Bangladesh. We have tried to avoid reporting on the basis of Rapid Action Battalion's press release. Our report was based on the facts and analyzing news that was reported in the national media in Bangladesh. Considering the fact, analyzing information and based on our experience, we were confirmed that -this was the continuation of cool headed extra judicial killing by the Rapid Action Battalion in Bangladesh. By Bangladesh Media; Today, the online daily from Bangladesh BD News 24 published a follow up report, referring to an eye witness, a farmer who was working at the moment beside the scene states that the victims were killed in a planned way and it was a cold blooded extra judicial killing! BD News 24 reporter Abu Sufian and Benzir Ahmed Benu reports from Bangladesh. In a report with a heading "RAB shot from point-blank range: eyewitness", BD News 24 report that "at least one of the six killed in the Monday's 'gunfight' with Rapid Action Battalion at Narshingdi was shot from point-blank range, suggests account of an eyewitness." Reffering to the eyewitness, it says "-The witness, whose name and age cannot be disclosed for safety reasons, was interviewed by bdnews24.com on Wednesday. The witness is a farmer who was working in his field when the incident took place." "I was irrigating my field when a vehicle carrying RAB members stopped on the road. I saw at least 10 people sitting inside," the witness recollected. "All of a sudden I heard incessant gunshots and took shelter inside the thatched hut erected for housing the pumping set," he added. Hiding in that thatched hut, barely 12-15 yards away from the spot near bridge No. 5 at Narshingdi where the 'gunfight' took place, he witnessed a part of what followed on the road right before his eyes. "From my shelter, I saw a man lying on the road on his belly when dressed RAB men shot him holding a gun against his back," he recounted with horror in his eyes. Local journalists said on reaching the spot, they found two bodies lying in the roadside ditch, two inside a micro bus, one on the road and another on a truck. The man found on the road matched the witness's account of the incident. 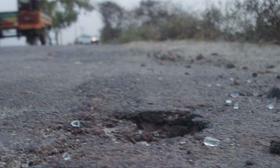 The bdnews24.com correspondent visited the spot and found a hole about three-inch deep, apparently created by a bullet fired from point-blank range, at the place where the body was found on the road. Human rights activists said the force is accused of numerous such allegations while the force continued to reject its involvement in any such incident. Citing an example, a human rights activist recollected the killing of Mukul Mondol, 32, a resident of Pairadanga at Michhakhali in Jhenidah. He was killed in a 'gunfight' with RAB on Oct 5, 2011. He said that there were three bullet wound marks on the back of Mondol, also a Communist Party member, and three holes were found in the field where he was shot. Bullets apparently pierced through the body of Mondol and hit the ground, he felt. Family members of the six killed in the Narshingdi 'gunfight' have already said that the incident was a planned killing and there was no 'gunfight'. Farmers who work in the fields close to the bridge No. 5 area said usually the area becomes deserted during afternoon when they go for lunch. The incident took place at 2:30pm. The area was found deserted around the same time on Wednesday, too. Traffic movement was also thin during the time. The witness bdnews24.com interviewed also recollected that he could remember three to four members of RAB visiting the area over the last few days where the 'gunfight' took place on Monday. According to the RAB version, the 'gunfight' took place as they went on a drive to recover Tk 40,000 snatched from a businessman named Maruf Hossain, who they claimed made a distress phone call and reported the incident. All the six killed were termed as 'infamous robbers' by RAB, but only two of them were found accused in two cases. The other four killed and four others injured and arrested after the 'gunfight' do not have any criminal record. Two days after the reported gunfight, the force itself failed to find whereabouts of Maruf, raising further suspicion over the authenticity of RAB's version. Deputy assistant director of Rab-11 Maj Khandker Golam Sarwar, who participated in the force's Narshingdi 'drive' on Monday, however, rejected the allegation of shooting anyone from point-blank range. He was unable to recollect where the bullet hit the man and then whether it pierced through his body to hit the road. "I have to see before I confirm whether the bullet had hit the man in his abdomen or in chest. So I should not comment on the issue as I am not an expert," he said. "The situation was too tense to comprehend what was happening at that time. People who have not seen the incident cannot imagine the situation," he claimed. In a press release issued after the 'gunfight' carrying signature of the officer, it was stated that the captain of RAB-11 was informed that a robbers' group was roaming around Narshingdi city after looting Tk 40,000 from a businessman. Acting on the information, a RAB team divided into several groups conducted drive at various locations in and around the city. "The robbers, who were preparing for another robbery near bridge No. 5 of Narshingdi, intercepted the microbus carrying the RAB members by creating roadblock with a truck. From behind another microbus, the robbers started firing at RAB men in the microbus," read the release. It further said that the criminals were killed as RAB had to open fire to 'protect lives and property of the government'. It also claimed that RAB SI Shahid and constable Saiful Islam were also injured in the gunfight. Three pistols, an LG, a bullet shell, two knives, 10 rounds of bullets and Tk 40,000 were recovered from the possession of the robbers, the release added.